Another report on product shrinkage/price increase, this time for Coca cola. Anyone else notice this at the shops? Well the receipt has been cropped so a price is not evident but could be on the full image?? The glass bottle range have been dearer to buy than the PET ones so as a comparison of them I am not sure it is same for same. Just as a comment to product bottle size to price you only need to compare 600 ml bottles at around $3 to $4.50 to 1.00 litre bottles at $4.25 and 1.25 litre again at around $3.00 to $4.50 and then the 2 litre at around $3.00 or even less on specials…price of the PET perhaps (some small amount of sarcasm there but could packaging be the larger cost…ok a lot of sarcasm). I have always felt that the price of the smaller quantities are far larger than they should be on reflection at the larger amounts at per 100 ml being vastly cheaper and even at times being cheaper for the entire amount than the smaller bottles. Is it a Shonky? Worth a nomination? Here’s an uncropped version of the photo, $8.95 being the price. Thanks for the thoughts @grahroll. The weight of the glass could be a factor here, but seems like a big jump as you note. Thank you @BrendanMays for the pricing info. 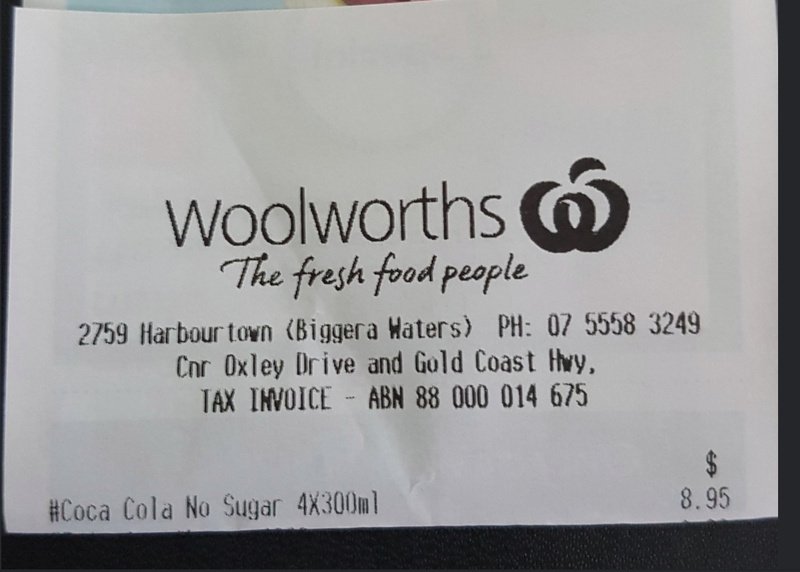 The price seems abnormally high, on visiting the Woolworths online portal the 12 X 300ml pack is selling for $10 at the moment so a price of $2.78 a litre. Coles has the 12 pack product as temporarily unavailable but the unit price is $3.19 per litre. 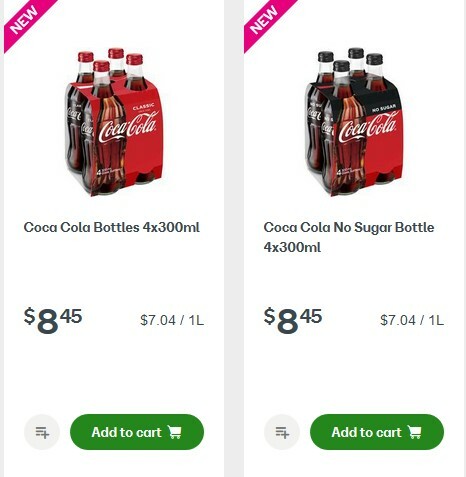 On the Woolworths’ online site the 4 X 300ml are showing as $8.45 ($7.04 per litre). I think the 12 packs are PET bottles though, so is the Glass 4 pack price based almost solely on being in glass? Heavier freight, more costly to bottle? Or what else (I don’t think the 10 cent refund is adding that much to the cost of supply)?? But to add to my earlier post re the pricing and the disparity between sizes. The 600ml cost starts to rise to those meteoric values per litre of the 4 X 300ml ones at $5.65 a litre. I have included a Pepsicola ™ brand as well to show they to are not exempt from what I think is absurdity. I really don’t know how the pricing model is determined for any of them…other than to profit some businesses. $2.78 per litre vs $7.04 - massive premium for the preference of glass. At that range, I sure hope people are just grabbing a cup instead. Thanks for laying out all this research, I’ll be sure to pass it on to my colleagues. I wonder if it is the top selling size and number…so either the supermarkets or CCA can have a higher profit margin knowing that they will still sell even though there are cheaper $/L options. That would be a good thing (on both counts), wouldn’t it? It’s a fairly unhealthy product - so may encourage lower consumption while being a de facto sugar tax (without all the politics). My only comment is that I hope bottles of this foul dark liquid continue to decrease in size, until they vanish entirely! I appreciate your point and concede that in some cases of product shrinkage there maybe unintended benefits. However, this isn’t a tax but rather a financial windfall for the Coca Cola company along with a reduction in value for the consumer. It’s what appears from my point of view to be part of a larger trend in a country where food is already expensive comparitive to other parts of the world. Depends what the purpose of the price increase caused by a “sugar tax” is. If the purpose is to ensure a higher price and therefore to reduce demand (and hence consumption) then it doesn’t matter who gets the money. If the purpose is to compensate the taxpayer, who will foot a large part of the bill for all the consequent health problems, then it does matter. That applies regardless of who gets the money. Basically every product-related tax reduces the value for the consumer. PS I am not suggesting for one second that the company is motivated by the public benefit. I love a slug of coca cola … but I too will do my best to never have another drop it’s not even good as soldering flux these days !!! We’ve had another report concerning Coca Cola products - this time at Coles with 1.5lt bottles of Coca Cola with a 20% extra sticker on the label. The bottles were priced the same as the regular 1.5lt bottles but when our vigilant consumer measured the amount and found it to be only 1.5lt, meaning it’s actually a 1.25lt bottle with 20% extra… therefore it should be the 1.25lt price, no? I just had a look at Coles website. Coke 1.25l Special $2.15 Save $0.85 $1.72/L. 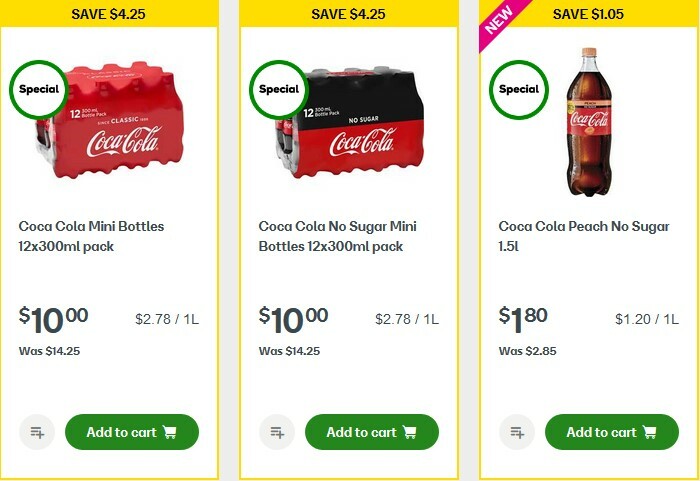 Coke 1.5l Special $2.15 Save $0.85 $1.43/L. As the kid on The Chaser used to say. “Scam”. I use it as a more environmentally friendly drain cleaner. 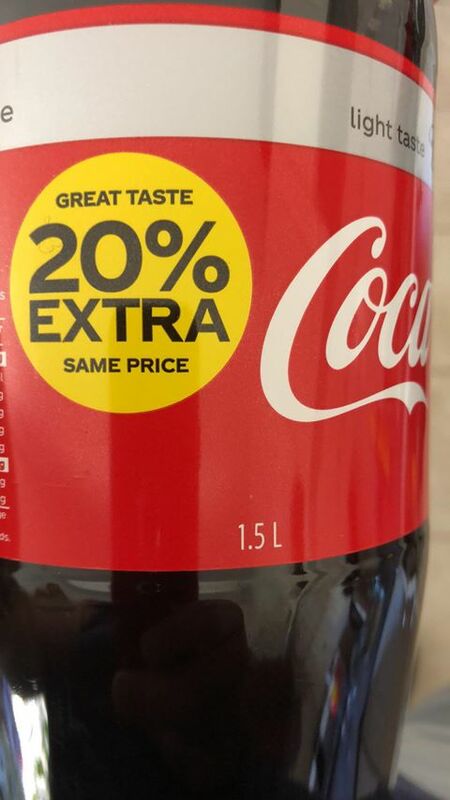 Normal bottle sold in the stores is 1.25 lt not 1.5 lt so the 20% extra probably is true. Common bottle sizes in store are multi packs of smaller sizes, 385 ml (used to be 400 or 425 ml I think but downsized), 600 ml, 1 lt (usually sold cold and seen mostly in Coles), 1.25 lt and 2 lt. All the 1.5 lt CC bottles have the 20% extra label on them. As the price is the same for both the 1.25 lt and the 1.5 lt, it appears they are correct to say it is 20% for free. The unit price reflects this discount ie for 1.25 lt the per lt is $1.72 and the 1.5 is $1.43. 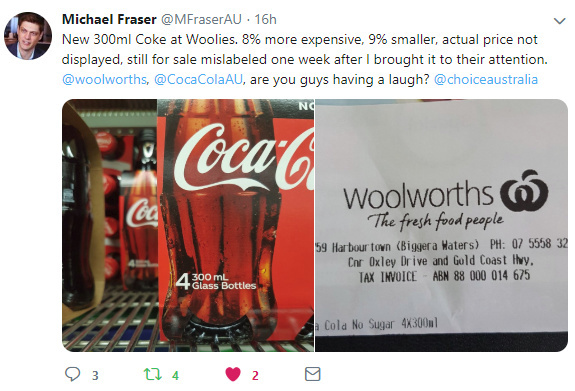 Perhaps they are testing the market to see if 1.5 lt are a more popular buy and they might then phase out 1.25s making it a difference between Pepsi Cola and CCA stuff.